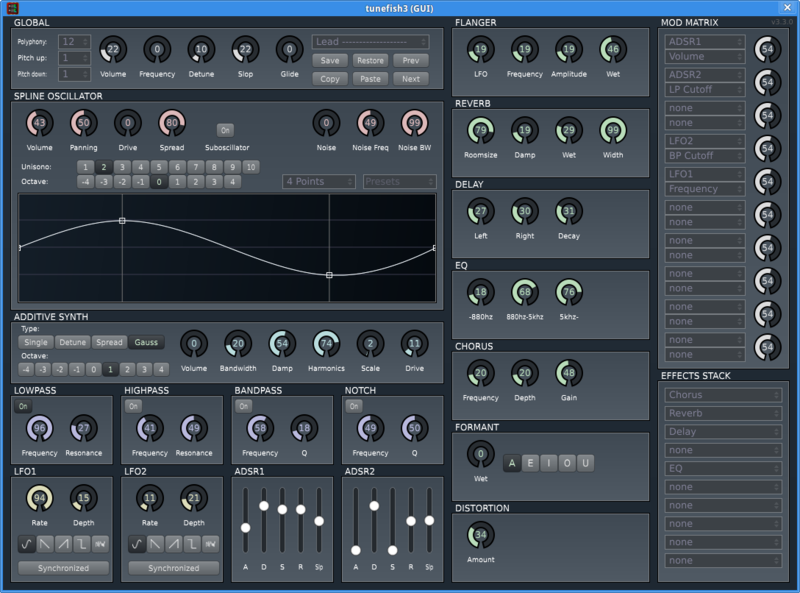 Tunefish 3 is a virtual realtime mono/polyphonic VST softsynth developed by Christian 'Payne' Loos and the Brain Control group, currently at version 3.3 for the linux platform. It's available at the Tunefish-synth website (link below). Tunefish 3 utilizes a spline-based oscillator, as well as a noise signal section and an additive-synth section. The spline oscillator section has its own suboscillator, and controls for drive, panning and signal spread. The preset waveforms provided include sine, sawtooth, triangle and pulsewave. These basic waveforms can be modified using points on the graph (up to six points can be used), with step, linear and spline interpolation. The noise section includes frequency and bandwidth controls. The additive synthesis section includes single, detune, spread and Gauss apodization windows, octave detuning, and additional modulation options such as Bandwidth, Harmonics, Scale and Drive. Like Tunefish 4, Tunefish 3 includes a filter section with lowpass, highpass, bandpass and band-reject (notch) filters; two assignable LFOs with synchronizable sine, saw-up, saw-down, pulse and noise waveshapes; two assignable ADSR envelopes; and a variety of effects which can be chained as desired in the effects stack section: chorus, flanger, delay, reverb, 3-band EQ, formant and distortion. Assignable features can be organized within the Mod Matrix on the right side of the GUI. The soundbank page for Tunefish 3 at KVR Audio: HERE.